Below is a summary of a medical malpractice lawsuit filed in Baltimore City on February 1, 2016. This case involves a claim that a surgeon negligently severed the patient's medial artery during an angiogram, causing a permanent injury to the patients arm. 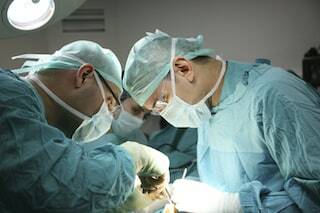 Plaintiff also alleges that the surgeon failed to realize he cut the nerve, so he did not take critical steps to mitigate the harm that had been done. The lawsuit is against St. Agnes based solely on its actual or apparent employment of the vascular surgeon. A man is diagnosed with an arterial disease. His vascular surgeon performs an angiography procedure at St. Agnes Hospital. Access was achieved through the man's left brachial artery (in the upper left arm). The man remains at St. Agnes Hospital for just over 28 hours. The medical records show seven occasions when he complained of upper left arm pain, soreness and limited range of motion. The hospital treats these symptoms with oxycodone and instructs the man to follow-up in two weeks. When the patient follows-up with the surgeon, his condition has worsened. He experiences post-procedure swelling and bloody oozing at the incision cite, and he is unable to flex or extend his left wrist and fingers without pain. He is referred to a neurologist for further evaluation. The neurologist finds severe and complete left median neuropathy (nerve disease) in the forearm. He receives physical therapy on his forearm for one year at St. Agnes. However, he still continues to experience pain and numbness. The neurologist finds that he is "completely disabled" and refers him to a neurosurgeon for a second opinion. Imaging reveals a large number of problems related to nerve damage throughout the man's forearm. The neurosurgeon concludes that the man has neuropathic pain syndrome, a severe nerve injury. The neurosurgeon originally plans to operate on the man's arm but instead refers him to the Johns Hopkins Hospital physical therapy department. The doctor at Johns Hopkins notes, among a number of other problems, that the man has no motor responses in his forearm. Problems with the man's left arm continue. He presents to the Defendant doctor's office with complaints of shoulder pain. The Defendant doctor refers the man to Good Samaritan Hospital Orthopedics. He is diagnosed with adhesive capsulitis, left rotator cuff tendinosis, and mild left glenohumeral arthritis. The man files a medical negligence and failure to obtain informed consent lawsuit in Baltimore City. It is alleged that St. Agnes Hospital and the Defendant doctor violated the standard of care by failing to (1) properly perform surgery, (2) perform appropriate tests to determine the nature and severity of the man's condition, (3) promptly employ correct treatments to address the man's injuries, and (4) inform the man of the alternatives to his various treatments. As a result of the Defendants' negligence, the man has experienced permanent and disabling injuries preventing him from engaging in his normal activities and vocation. The Plaintiff will also claim past and future medical bills and lost wages. Failed to inform the man of the alternatives to his various treatments. The defense in this case is very predictable. A peripheral nerve injury is a recognized potential complication of cardiac catheterization and angiography. The surgeon and St. Agnes will argue that all surgeons who perform this procedure have had the occasional rare patient who has suffered some nerve injury secondary to nicking of the nerve with a needle or trauma during the dissection. This defense does not address the question of whether it was negligence in this particular case. Death is also a known risk in this procedure, too. But that does not mean that you can chalk up every death with a "you knew it was a risk" defense. The severity of the injury here is uncommon. Peripheral nerve injuries commonly heal over a period of months and rarely cause permanent disability. The permanent injury articulated in the Complaint is his case appears to be significant. If you have suffered an injury or lost a loved one as the result of a doctor or nurse's mistake, you need an experienced medical malpractice lawyer on your side. Our law firm has a history of getting large verdicts and settlements in medical malpractice injury and wrongful death cases for our deserving clients. Call us today at 800-553-8082 or get a free online case review. Take a look at another lawsuit against St. Agnes for misdiagnosing a heart attack. This lawsuit was filed just days before this claim filed.